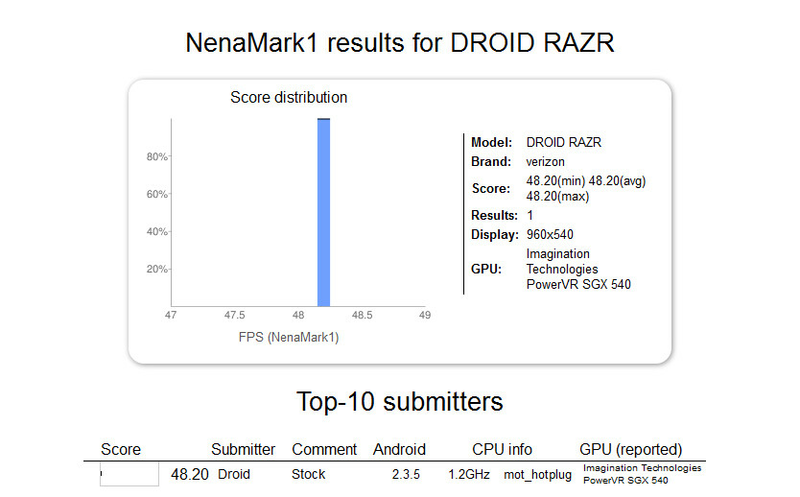 As the Motorola DROID RAZR (aka Motorola DROID HD) progresses toward a launch, someone took the model out for a spin on the NenaMark Benchmark web site. From the site, we can confirm that the screen on the phone will have a qHD resolution. Although the test revealed that the handset is currently using a dual-core 1.2GHz processor rumored to be the TI OMAP 4430, there is some speculation that Motorola will opt for the TI OMAP 4460 which clocks in at 1.5GHz, but is allegedly delayed. The Benchmark test also shows that the DROID RAZR will have a Power VR SGX540 GPU inside and Android 2.3.5 will be driving the device. You might note that the device used for the test had a stock Android OS on board, although that could change by the time the phone is launched. The NenaMark1 test is a graphics performance benchmark application for Android models. 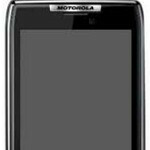 The Motorola DROID RAZR scored 48.20 on the test, above the 47.58 score of the Motorola DROID BIONIC and the 46.83 received by the Motorola DROID 3. The highest score belongs to the unannounced Samsung Illusion which came in with a tally of 79.20. Verizon really wants to get the Motorola DROID RAZR out in time for the holiday season. Now that it has appeared on the Device Manager and the NenaMark Benchmark site, the unit is probably packed and ready to visit the FCC. I hope this comes out same time as the prime so I can make my decision. LTE, kevlar and water proof really makes me want this phone. I had to replace my old droid twice already because of water. The lack of ICS is probably the only down side I can see to this Droid. . Except Motorola and Verizon lately has been notorious for difficulties in unlocking the phone (if this pertains to you). Their camera modules aren't that good either and despite the only one of the three with HD in its name, it has the lowest resolution (no 720p). Why can't there be a perfect phone!! IMO I'm still going to trade in my original Motorola DROID for a Nexus Prime. +1 grain of salt. Still, this has all the potential to be a great device. And @bolaG, even though it will likely not launch with ICS, given Motorola's track record with high end Verizon phones, it and the Bionic will see it very shortly after. Yeah I know they will get the ICS update soon enough, but if its designed for GB itll have those bottom buttons and thats what I'm not looking forward to. I like the idea of the screen taking the space of those buttons. My old G droid just took its second dive in the water this year so I upgraded to the Bionic. I hate the screen. My old droid had much better pixel density. I can acctually see the pixels in the Bionics screen. Other that that the phone is outstanding. Either way I will be returning it to see what the other monsters have in store. Just wanted to know how much does Samsung Galaxy S2 score on NenaMark Benchmark test? Was anyone else caught off guard by the Samsung Illusion score? I thought that was supposed to be an entry-level phone.